The Frederic Tebeau house now at the corner of Whitaker and Perry streets in Savannah, Georgia. Caus'd you to seem so much agrieved! Pray tell me, was it so? Be pressed in spirrit [sic] though! Let not the loss of one, though fairEnshroud your brow with gloom and care! O, let ' Magnolia's leaf now greenNe'er by any be withered seen. My Pendleton cousins in Bryn Athyn, Pennsylvania, have several letters written by Philip to Catharine before and after their marriage, and several are quoted in Confederate Memoirs. In one letter that he wrote before their marriage he says, "I have been anxious to both see and hear from you, and am always thinking of you...and have felt how necessary you are to my happiness." 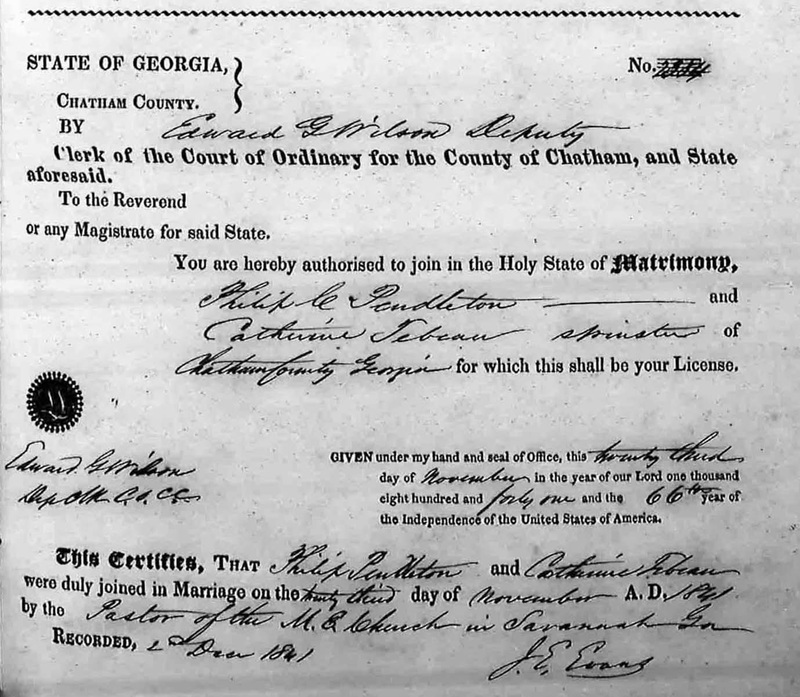 Catharine and Philip were married on November 23, 1841, in Savannah by the pastor of the Methodist Episcopal Church. Philip traveled around Georgia and South Carolina in the early years of their marriage to gain subscribers, contributors, and an editor for the Magnolia. 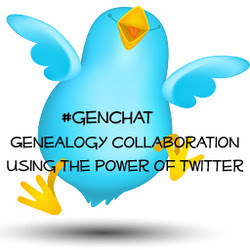 (It was Catharine who said writing is the Pendleton family curse, something my dad repeated to me years ago.) Catharine and Philip may have lived with her parents while Philip traveled, as Catharine gave birth to their second child William Frederic at her parents' home in 1845. Their first child, Edmund, died the following year when he was just three years old. Prior to giving birth to their third child James, Catharine's little family moved to a farm in Effingham County that her father had bought. 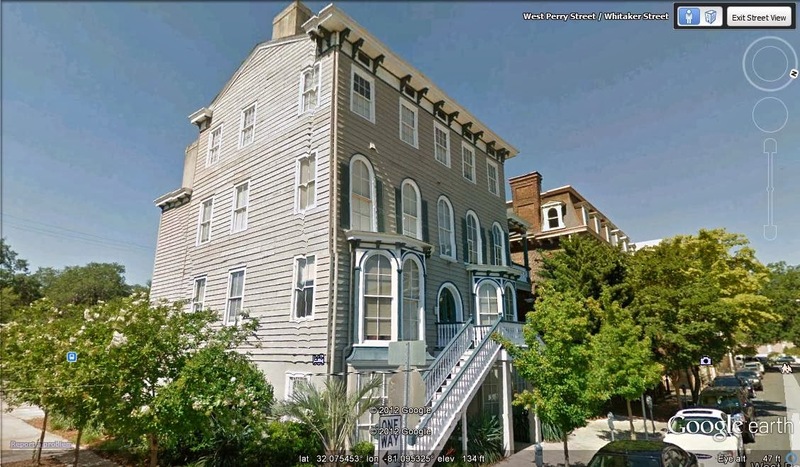 Philip taught school while they were living there, and Catharine gave birth to sons James Aubrey (1846-1881), Philip Coleman (1848-1870), and Charles Rittenhouse (1850-1914). In 1851, the growing family moved to Powelton in Hancock County, Georgia, where Philip taught school for two years. 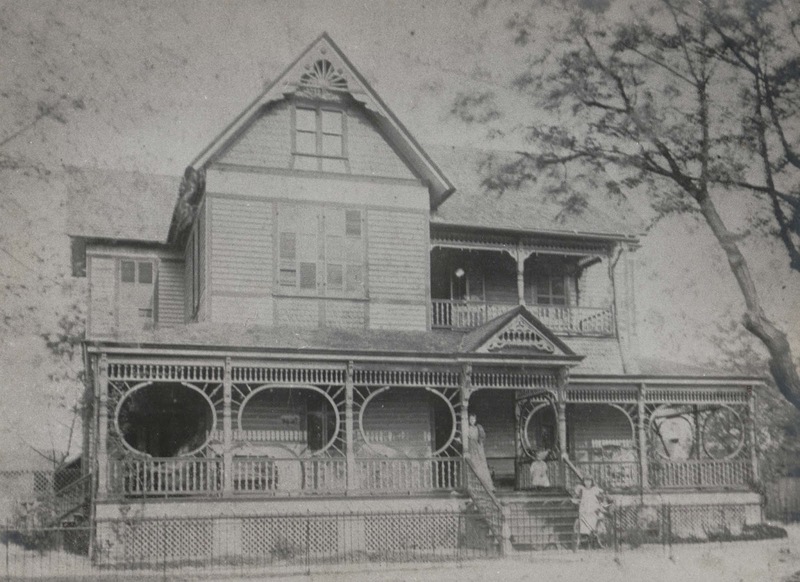 Catharine gave birth to daughter Emelyn (Emma) Tebeau here in 1852. In 1853, the family was on the move again, this time to Sandersville in Washington County. Philip stopped teaching to practice law (for which he had trained years before), and he bought the Central Georgian newspaper. Catharine gave birth to son Alexander Shaw (1855-1925, my great grandfather) and daughter Mary Zella (1857-1932) while they were living in Sandersville. Catharine contracted tuberculosis and her health was failing, so the family left Sandersville in 1857 and headed back to the Savannah area where they stayed briefly. Philip thought moving further south to "the piney woods" would benefit Catharine's health, so he and Catharine's brother Lewis bought farmland next to each other in Ware County, and in 1858, Catharine and Philip moved their family again. They called this area Tebeauville in honor of Catharine's father (now Waycross). Catharine gave birth to their son Lewis (later spelled Louis) Beauregard here in 1861, just before the start of the Civil War. When the Civil War began, husband Philip and oldest son William, who was just 17, joined the Confederate Army, leaving Catharine at home with seven children. I'm sure the older boys helped their mother and looked after their younger siblings. In the latter part of 1862, Philip became very ill and had to return to Georgia from his post in Virginia. He brought William back with him because a law had been passed that soldiers had to be at least 18 to serve. I'm sure Catharine was glad to have her husband and son back home again! This joy was must have been short lived when William rejoined the war as soon as he turned 18 in March 1863. Catharine and Philip moved yet again, and by 1864, they were living at an area called Cat Head in south Lowndes County, Georgia, south of the county seat of Valdosta. One of the houses of Catharine and Philip Pendleton. They had a house at Cat Head in south Lowndes County, south of Valdosta, and later moved to Valdosta. I don't know which house this is. Philip began the first newspaper in Valdosta called the South Georgia Times (now the Valdosta Daily Times) in 1867. Just two years later, Catharine and her children were devastated when Philip died as a result of his wounds from a buggy accident in June 1869. Their young, four-year-old son Nathaniel Dandridge (1865-1937) was with Philip when the buggy overturned, but he survived. The older boys took on the responsibility of running the newspaper and providing for Catharine and their younger siblings. Tragedy struck the family again when son Philip died from typhoid in 1870, and again in 1881 when son James died. Sons William and Nathaniel were the first and second bishops, respectively, of the Swedenborgian church in Bryn Athyn, Pennsylvania. Son Charles was editor and owner (later part owner) of the Macon Telegraph in Macon, Georgia. Son Alexander opened a small fruit stand that grew into The A. S. Pendleton Co. wholesale grocers. His business operated nearly 100 years. Daughters Emma and Zella were teachers, and Emma had several of her stories published in the Macon Telegraph. Son Louis wrote and published several novels and a biography of Alexander H. Stephens (vice president of the Confederate States of America). 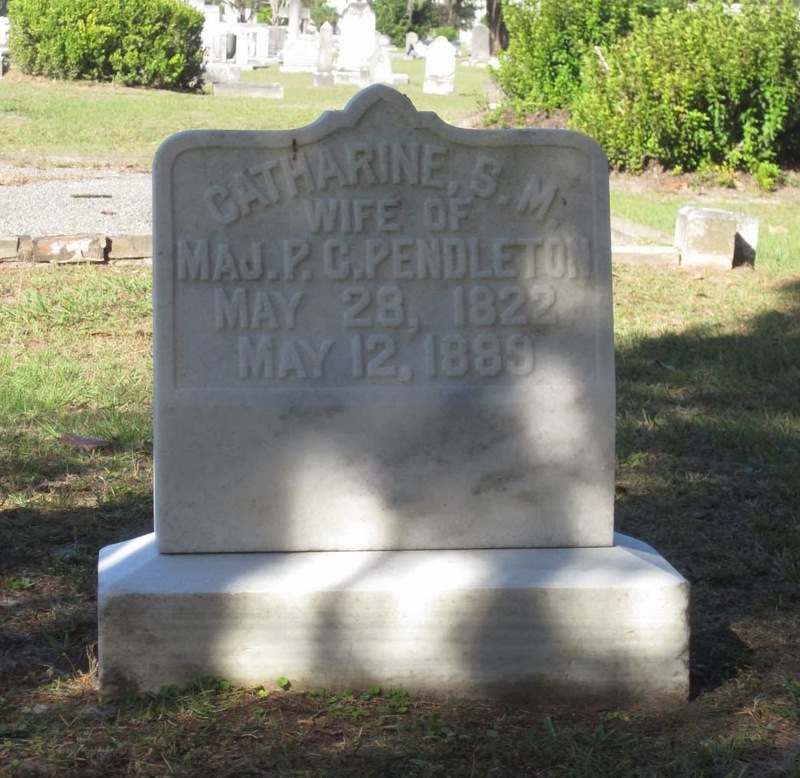 Catharine died on May 12, 1889, in Valdosta, 16 days before her 67th birthday. She's buried at Sunset Hill Cemetery in Valdosta next to her husband Philip. Melody Pullen. "Work on Tebeau House Underway." Savannah Evening Press. September 17, 1985, p. 1, 2. Constance Pendleton, ed., Confederate Memoirs: Early Life and Family History, William Frederic Pendleton and Mary Lawson Young Pendleton. (Bryn Athyn, Pennsylvania, 1958), 12, 13. Constance Pendleton, ed., Confederate Memoirs: Early Life and Family History, William Frederic Pendleton and Mary Lawson Young Pendleton. (Bryn Athyn, Pennsylvania, 1958), 12-29, 52.